"An evocative, beautifully-told story of identity, relationships and freedom, set in contemporary South Africa"
Grace and her Cape Town friends are renting a house on the coast – after exams it's their rite of passage into adulthood. Yet 'maturity' means different things to each of them. Brett and Louisa have plans – university, travelling – but Grace is uncertain of her future. Anxiety drives her to take control of whatever she can, starting with her own body, and it is starting to worry those around her. When Grace meets Spook – an older, nomadic surfer – their attraction is instant and his relaxed familiarity and assured confidence catch her off-guard. Can she allow herself to lose control, and fall in love? 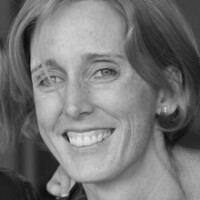 Rosie Rowell was born and grew up in Cape Town, SouthAfrica. After completing a BA degree in English and Economics at the Universityof Cape Town, Rosie arrived in the UK on a short working holiday and neverquite managed to leave. She now lives in in the wilds of West Sussex with herhusband and three children, but returns to South Africa as often as the bankbalance will allow. She has recently completed a MA in Creative and LifeWriting at Goldsmiths University of London. Her first novel, Leopold Blue, was published by Hot KeyBooks in 2014.